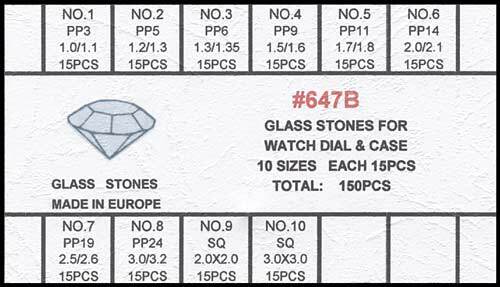 Foil back glass stones for watch dial & case. 10 different sizes, 15 pieces each size, a total of 150 pieces in this assortment. 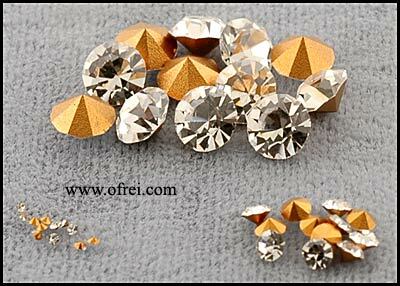 Size includes 1.0/1.1mm, 1.2/1.3mm, 1.3/1.35mm, 1.5/1.6mm, 1.7/1.8mm, 2.0/2.1mm, 2.5/2.6mm, 3.0/3.2mm, 2.0x2.0mm, and 3.0x3.0mm. 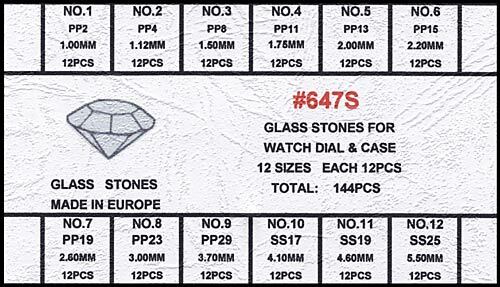 Foil back glass stones for watch dial & case. 12 different sizes, 12 pieces each size, a total of 144 pieces in this assortment. 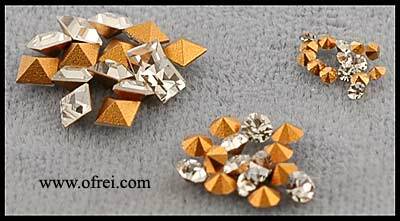 Size includes 1.00mm, 1.12mm, 1.50mm, 1.75mm, 2.00mm, 2.20mm, 2.60mm, 3.00mm, 3.70mm, 4.10mm, 4.60mm, and 5.50mm.